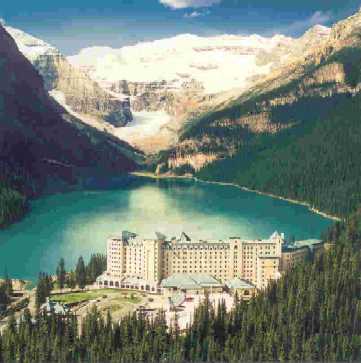 What Fairmont Chateau Lake Louise Offers You? Fairmont Chateau Lake Louise - the “Diamond in the Wilderness”, is located on the shores of Lake Louise in Banff National Park. The Lake Louis Chateau, an elegant and Bavarian-style hotel, is a public landmark that continues to be selected among the best hotels in North America. Comparing with its sister Banff Springs Hotel, the chateau is quieter and has less tourism. It was built in 1890s and has been so many renovations. You can see Swiss elements everywhere. From alpine flowers to photographs of Swiss guides who were the first employees of the hotel. 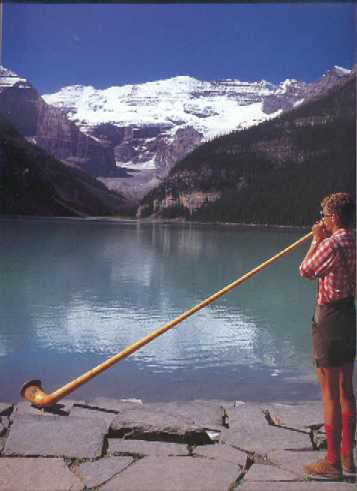 Once in a while, we like to stay for the weekends in the Chateau, overlooking the lake and the stunning Mount Victoria and Victoria Glacier, watching an alpenhorn player performing outside of the chateau. No matter if you are guest or not, you can experience the refined elegance of this famous hotel by reserving a table for afternoon tea in Lakeview Lounge. We really like to have meal or drink by the window in the Chateau to enjoy the beautiful famous view of the lake. The guestrooms in the Chateau are very elegant, warm and comfortable with pine and oak furniture, and luxurious feather duvets. Chateau Lake Louise offers the large variety of guestrooms in size and decor, from standard Fairmont rooms, Dulex rooms, Junior Suites, One and Two Bedroom Suites, Belvedere Suites to Royal Suites. All sizes of the rooms have options of Lake View and hillside or Mountain View, except Royal Suites, which only have Lake View. The chateau is constructed with three wings. The lake view rooms or suites in the middle wing have the best views of the lake and glacier. We were lucky to stay in one of Junior Lake View Suites during our company’s Christmas Party. 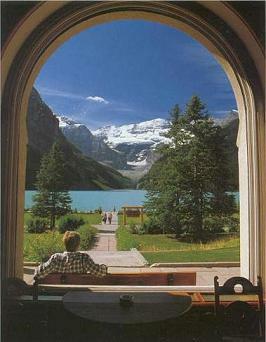 I just like to sit at the chair by the window with stunning view of the Lake Louise and Victoria Glacier and do nothing. The standard Fairmont rooms are designed for two people. We (two of us without kids) stayed in a Fairmont Lake View room. We really enjoyed. Deluxe rooms are one size larger than Fairmont rooms. Suite rooms starting from Junior Suites, which offer large sitting/living area. One / Two Bedroom Suites offer you separate sitting area for additional comfort and privacy.The exclusive penthouse Belvedere Suites provide a peerless, towering view of the surrounding landscape. They have dining area, private balcony, and en-suite bathroom. You can choose the Lake View suite or Mountain View suite. The top Royal Suite offers you elegant salon, two luxurious baths and an expanded open balcony. You will enjoy panoramic 360 views of the Majestic Lake Louise, Mount Victoria and Victoria Glacier from the picturesque windows or your private balcony. The wide variety of dining experiences is available in the hotel. You have six dining options, from 24hr Chateau Deli, Afternoon Tea House, to fine dining Fairmont Dining Room restaurant, to choose inside of the hotel. Every time we visit the chateau no matter we stay overnight or not, we always like to spend time in the tea house to have some traditional English tea and deserts, and enjoy the stunning view of Lake Louise through the huge window. There are 20 shops and services in the hotel, including sport shops (sport clothing and equipment rentals), clothing and gifts shops, galleries, jewelry stores (you can find loose gemstone as well), bookstore, and photography service. If you are outdoor adventurer, this hotel offers you exciting outdoor activities for all seasons. Mountain Heritage Program – Hiking tours from easier to more challenging level. Boat Cruises – Lake Minnewanka Boat Tours. White-Water Rafting – reservations are required. Snowshoeing to Great Divide – The point where all waters flow either to the Atlantic or the Pacific. Walking at Lake Louise by Moonlight - Journey into the woods on snowshoes and enter a world of stillness and mystery after dark. Skating Parties on Lake Louise – It is free to skate, only pay the skate rentals. If you are traveling with little children, and you really want to do some adventurous activities without bring little one, you can dropped off your children at their babysitting service, and you are ready to go to enjoy and have a fun. After a whole day outdoor activity, you can spend time at the exclusive Escape Spa & Salon – An Aveda Experience that will relax, rejuvenate and revitalize you. If you want to find out what other travelers have to say about the Fairmont Chateau Lake Louise, please click here. If you want to shopping around other hotels in Banff National Park, please click here for staying in or near Town of Banff, or click here for staying in Lake Louise.